With protesters rallying outside the Democratic National Committee’s (DNC) annual meeting in Chicago this week, carrying signs demanding that the Democratic Party “live up to its name,” progressive groups in favor of limiting the outsized power of superdelegates urged the committee to embrace a plan aimed at honoring the will of voters. Opponents of the proposal—including 2016 superdelegates hoping to hang on to their disproportionate ability to select a presidential nominee—pledged to lobby aggressively in favor of keeping the superdelegate system as it is. But supporters of Sen. Bernie Sanders (I-Vt.) argued that doing so would not only be unjust to voters in favor of a more progressive Democratic platform, but also imperil the party. In the 2016 election, most superdelegates threw their support behind Hillary Clinton, with many going against the majority of their constituents who had voted for Sanders in the primary. The resulting outrage among the party’s progressive wing led to the formation of the Unity Reform Commission and its proposal to strip superdelegates of their outsize influence. 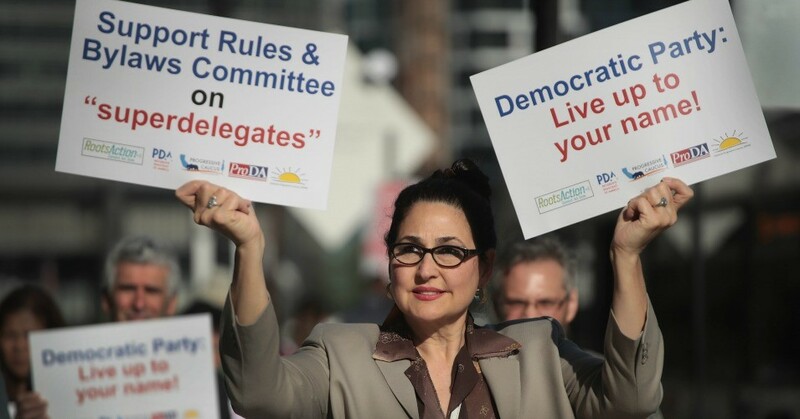 Earlier this year, the plan won the support of the DNC’s Rules and Bylaws Committee and a scheduled vote on Saturday by the entire body of party delegates will see it either adopted or defeated. [The proposal] would prevent superdelegates from casting a vote on the first ballot at the 2020 Democratic National Convention—unless one of the candidates has already secured enough democratically elected “pledged” delegates in primaries and caucuses to win the nomination outright. On Saturday, passage of this proposal from the DNC’s Rules and Bylaws Committee would give a big lift to Democratic Party outreach and enthusiasm nationwide—indicating that the party is opening toward grassroots democracy. More broadly, grassroots activists are urging increased democratic participation and financial transparency to strengthen the party and help it win more elections. Fearing the plan’s popularity, opponents have claimed that a change to the party’s nominating system should require a two-thirds vote instead of a simple majority—an argument Jeff Cohen of RootsAction.org rejected. Ahead of Saturday’s vote on the issue, Our Revolution circulated a petition calling on proponents of a fair voting system to add their name to the list of supporters of a number of democracy-strengthening initiatives.